The Liverpool Echo reports that Police have said a shortage of cabs could lead to increased crime in a Merseyside area, with it also being revealed some fares there will rise by over a THIRD. The substantial increase is set to hit black cab customers in Wirral across all tariffs following a consultation with drivers. It came as results from a survey about cabs in the area revealed what a difficult position the industry is in – including insufficient demand, fears visitors to the area will not return because of bad experiences, and potential crime caused by a lack of night time services. Two separate documents are set to be discussed by Wirral council’s licensing, health and safety and general purposes committee when it meets on September 19. The first of those – a review of Hackney carriage fares – has revealed how they are set for a significant rise – some by as much as 37.5%. Other fare rises aren’t so steep but are still going up – a one mile journey on the normal day rate tariff will rise from £4 to £4.60. For a one-mile trip on public and bank holidays, that will mean a 14.3% increase from £4.90 to £5.60, while on the Christmas and New Year tariff, that will see a huge 37.5% rise – from £6.40 to £8.80. Several representations from industry figures were made to the council over the proposals, with both supporting and opposing views submitted. One said the proposed increases were “excessive”, adding that it will lead customers to seek alternative transport options. Another letter to be discussed by councillors was from a private hire operator, who wrote that the changes “will assist us greatly”. He said “ill-conceived and unsustainable” Hackney carriage fare structures through the Liverpool city region meant private hire services already dominate “more than 80% of the Merseyside taxi market”. He added the rise meant private hire would be able to corner the “remaining 20%” of their target market. Members will be asked to consider the representations received by the council, and decide whether to bring in the new fares. Also at the meeting, the committee will discuss a survey about the supply and demand for Hackney carriage vehicles in the borough. Police officers felt there was a weekend and overnight “shortage” of both Hackney carriage and private hire in the area and, as they told the survey, “that did lead to potential issues of crime and disorder”. It suggested there was “insufficient demand” for the current Hackney carriage fleet, although many “gain significant fares” from phone orders. Asda in Birkenhead was the busiest rank, with the next two busiest Claughton Road and Liscard. The night rank Conway Street provided just 3% of total estimated weekly passengers. Of six ranks surveyed, one saw “poor” service, one was “fair”, and all others were “good” or “very good”. The only request for a new rank was for locations in New Brighton. People interviewed said they were more confident of getting a Hackney carriage in the day than at night, with 14% of those surveyed saying they could not get one. People were also unaware they could flag down a black cab. There are currently 258 licensed vehicles out of a current limit of 289. Mystery shoppers found good service from ranks and on trips taken. Hackney carriage drivers told the survey the limit on that number “should be retained”. The demand in Wirral is “generally both disparate and low volume”, but there are “frustrated” potential customers who need the service to benefit Wirral’s economy. It said the impact from that was that there was a “very high potential” people visiting the area would have poor experiences that may prevent them from coming back. The committee members will be asked whether they want to continue the policy of limiting Hackney carriage vehicle numbers, or to remove the policy “in order to allow further future development of the fleet when required”. That question will also be put to a public consultation. A party of young women from Salford were charged almost SEVENTY pounds for a minicab from Manchester to Tyldesley by controversial firm Uber. Nicole Owens, 25, from Boothstown, Worsley, said her and three other friends had been partying in trendy Northern Quarter bar Hula till about 3.30am on Bank Holiday Monday morning when they wanted to get a car home. 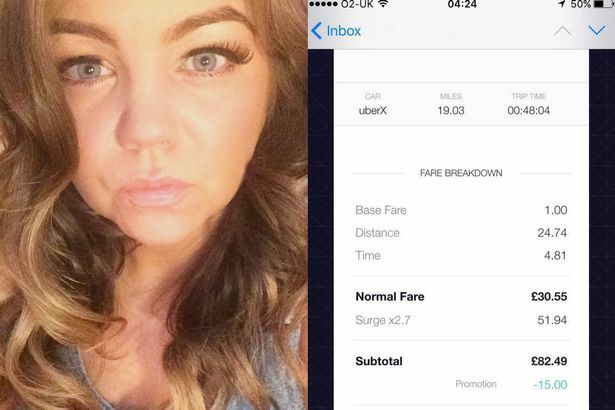 They eventually got an Uber minicab – but were left shocked at the final bill – which even included a £15 DISCOUNT. Now only after the M.E.N. took on her case have Uber agreed to a full refund. The group were taken back to Ellenbrook, then Boothstown, then Tyldesley, and then back to Worsley village. Nicole said: “We couldn’t get a taxi at all. Nursery nurse Nicole said that she installed the app and set up an account. Without the £15 promotional discount the fare would have been £82.49. A breakdown of the charges is clearly shown on the receipt, and states that the normal price for the ride would have been £30.55, but the ‘surge’ was charged at £51.94, bringing the price to £82.49 before the £15 discount. The app-based taxi service has come under fire before for its ‘surge’ charges that mean the busier it gets, the more it will cost. And according to Nicole the taxi arrived within 60 seconds, suggesting to her that the firm wasn’t busy. Nicole said: “Friends had told me they could be expensive. But a spokesman told the M.E.N. that the new pricing model is ‘very clear’ for customers and that they are asked to confirm the pricing multiplier in the app two times before they book a trip. However they offered a full refund to Nicole after the M.E.N. contacted them. A spokesman for Uber told the M.E.N. : “The pricing is made very clear to the user when they book: Open the app, the uberX option will be marked with a thunderbolt to represent that dynamic pricing is in effect. “Once you select the uberX option, there is a confirmation screen that notifies the user that the pricing is at 2.7 x the normal rate, users have to confirm with an “I accept” button. “Following this, the rider is required to manually type in the numbers 2 and 7 to re-confirm that they understand. BANBURY’S Hackney cab drivers have launched a campaign to increase their fares in a bid to help them cope with rising costs and increased competition from private-hire firms. The North Oxfordshire Hackney Association (NOHA) has petitioned Cherwell District Council to make the changes which would see the standard fair increase by 50p per journey, but would dramatically cut rates over the busy Christmas and New Year period. If approved the plans could see an increase in the current Hackney cab base rate from £2 to £2.50 for the first quarter mile, and an increase from 11p to 12p for each subsequent sixteenth of a mile. Choudhry Khalid Mahmood Anjum, chairman of North Oxfordshire Hackney Association, said a small fare increase is the only way drivers can cope with the current economic climate. He said: “We’re just asking for 50p extra. People pay more for a pint of lager or a ticket to a nightclub so what’s wrong with paying for a taxi to take them home? Hackney cab fares have not increased for more than four years but drivers currently charge double-time over the Christmas period, whereas private hire firms charge standard rates. NOHA consulted its drivers earlier this year before petitioning the council, which then wrote to all Hackney drivers in the district to canvas their opinions. All 123 Hackney Carriage Vehicle proprietors in Cherwell were consulted and 62 responses were received. A decision will be made at a meeting of the council’s licensing committee which takes place at Bodicote House today (Thursday) at 2.30pm. Fares are currently split into four tariffs listed as daytime, night time, Christmas and New Year, and Sundays and bank holidays. A SHAKE-UP of taxi fares across parts of Oxfordshire has sparked fears of higher prices and customer confusion. Customers and cabbies have raised concerns over moves to axe regulated fares for some taxis in Vale of White Horse. Meanwhile taxi fares could cost the same all year round in Kidlington, Bicester and Banbury under plans that have divided hackney carriage drivers. Vale of White Horse District Council could vote to remove its right to set fares for hackney carriages, which do not have to be pre-booked. Councillors hope the move will encourage competition by letting drivers charge what they want. But some customers and drivers fear the change could lead to confusion and higher fares. It would see Vale join neighbouring South Oxfordshire District Council (SODC) as the only English local authority not to set a tariff. Vale general licensing committee chairman Melinda Tilley said: “We are trying to reduce bureaucracy on people trying to make a living. Mrs Tilley said it would get more cabs out in the early hours, particularly to pick up Saturday night revellers in Abingdon. Councillors are to look at the policy in the new year before making a decision. It comes as the North Oxfordshire Hackney Association wants councillors to switch to a flat rate for taxis during the day, at night and on Sundays and bank holidays. This would see some fares increase by more than 10 per cent, but bring a massive drop in Christmas and New Year tariffs. It would only apply to the 123 cabs that can be hired in the street or at taxi ranks across the Cherwell district. Private hire firms would not be affected. The 6am to 10pm day base charge would go from £2 to £2.50 and the cost for every subsequent 101 metres would rise from 11p to 12p. This would increase the cost of a two-mile journey from £5.08 to £5.86 and four miles from £8.60 to £9.70. The 10pm to 6am night base charge would go from £2.30 to £2.50 as would the 6am to 1pm Sunday and bank holiday rate. Current Christmas and New Year base rates would drop dramatically, down from £4 to £2.50, with each 101 metres costing 12p instead of 25p. Cherwell District Council is to consider the change at a meeting in Bodicote House, Banbury, this afternoon. Some taxi drivers in Carlisle could be overcharging passengers by deliberately under-inflating tyres to fool the meter, a city councillor has claimed. The suggestion has been rejected by the Carlisle Taxi Association, which says tyre pressures have very little effect on the fare. The allegation came from David Morton, a Conservative councillor for Belah and a retired police officer. He told the regulatory panel this week: “As a regular user it amazes me that you can get a variety of taxis from the same venue, at the same time of day, to the same destination, and the price can vary by as much as 90p. “There’s a fault somewhere in the metering system – or it could be tyre pressures. Licensing officer Barry Sharrock promised that mechanics would check tyre pressures when taxis came in for routine inspections every four months. But Wayne Casey, chairman of Carlisle Taxi Association, believes there is another explanation for the variation in fares for identical journeys. The regulatory panel meeting on Wednesday agreed to freeze taxi fares for at least a year. The council reviews the level of fares every autumn. Last year councillors approved an increase of 20p in the flagfall – which applies to the first 0.7 miles of each journey – adding 4.1 per cent to the cost of a two-mile trip. This time licensing officer Sue Stashkiw recommended there was no increase, largely because fuel costs have fallen, offsetting increases in insurance and maintenance. Overall, taxi drivers’ costs were almost unchanged. The tariff will be reviewed again in September 2013 where the RPI will be calculated over two years. Taxi fares in Carlisle used to be the second highest in Cumbria. However, increases elsewhere mean they are now close to the average. A typical two-mile journey costs £5.30 in Carlisle, compared to £6 in South Lakeland, £5.50 in Eden and £5.40 in Barrow. I Allerdale it would cost £4.85 and £4.60 in Copeland. TAXI fares are to increase in Test Valley. Hackney carriage drivers had asked for the rise in charges, a request which was granted by Test Valley Borough councillors. Test Valley currently charges £5 for the first two miles on its daytime tariff, compared with rates of £6.20 in Winchester, £5.80 in Southampton, £5.80 in the New Forest and £6.10 in Eastleigh. Now this will increase to £5.40 – 1p more than the national average, but 45p less than the area average. Hackney carriages may legally charge no more than the maximum fare set by the council – such fares do not apply to private hire vehicles, which can charge what they wish. The Test Valley Taxi Association, which represents a large number of taxi proprietors, had argued that the fees had not changed since March last year. At a licensing meeting, in Andover, councillors heard that the request was a fairly minimal increase. Council members quizzed licensing manager, Michael White, who recommended approving the scheme, on whether this would lead to minicabs undercutting the association due to the increase. But Mr White said that the increase was the maximum fare that taxis can charge, so this would not necessarily be what is charged. The licensing committee voted unanimously in favour of the proposal at the meeting last Thursday and the fare changes will come into practice in the coming weeks. RAISING taxi fares by up to 12.5 per cent and expanding “peak” hours when higher tariffs apply will hit elderly people hard, angry customers have warned. Under new proposals due to be discussed at a Shepway District Council meeting tonight, the time periods that all local cab firms can charge one and a half times the standard tariff would be expanded. Currently the higher rate applies from midnight, but this could change to start at 11pm, and last all day on Sundays. Peak hours at Christmas and New Year would also be expanded, while charges for luggage and extra passengers could also rise. The standard rate for the first mile could be increased by 10.5 per cent, from £3.80 to £4.20, while subsequent miles may jump by 12.5 per cent. The proposals are contained in an SDC report which will be discussed by the licensing committee tonight. It follows consultation with local taxi firms which revealed that 35 out of the 49 drivers who took part – 71 per cent – supported fare rises. As the taxi licensing authority, SDC sets the maximum charge levels for all taxi firms in the district. Fares were last reviewed in October 2010. The report says the proposed increases are designed “to assist the taxi trade financially” to reflect the rising cost of fuel, and were put forward following a request from a member of the trade. The report also contains an alternative proposal representing a 5.2 per cent increase for the first mile of journeys, with no increase for subsequent miles. The committee does have the option to retain the existing charging structure, although the report recommends it considers a rise. The proposals have been criticised by taxi users. Violet Simmons, of Harbour Way, Folkestone, who suffers from osteoporosis and “heavily depends” on taxis to get about, called the hike “unfair”. Folkestone resident Bryan Andrew said he relies on taxis to go to the doctor and that prices were already high enough. John Arnold, director of Channel Cars, said he supported a price rise due to higher fuel and running costs although David Woods, company secretary of Folkestone Taxis, opposed an increase. TAXI fares in Fenland will rise – even though some drivers fear it may sound the death knell for their businesses. The licensing committee of Fenland Council today approved the increases- to take affect from May 2- and also agreed a 20p fee for those taking more than four passengers. Among those opposed to the increase was Bev’s Taxis who argued that a two mile journey would now be £5.30 as opposed to £4.34- a rise of 25 per cent. “People’s budgets are stretched and I do not think this is fair on behalf of the public to be possibly charged this greater increase,” the firm told the council. However the committee felt the proposed increase “would place Fenland around the middle banding of fares within the council’s similar basket of authorities as previously requested by the trade”. Bev’s Taxis also argued that customers were only just getting used to all taxis operating with calibrated meters but the council pointed out that once a request had been made to increase fares it had to consider it. Councillor David Patrick, a Lib Dem member but also a taxi drivers’ spokesman, told the committee that on short journeys the new fares would reduce the amount that can be charged. He also said the new tariffs were “particularly punitive” to those taxi firms that provided six or eight seaters. However the council said a meeting last month to set the ball rolling over fares increase was not attended by drivers who could have stated their objections then. He added that a major concern will be when a customer calls to make a booking from a village “it won’t be financially viable for taxi drivers to do jobs that do not come into Wisbech or go through Wisbech on the journey.” He wanted a fee for phone bookings but this was refused. Councillor Kit Owen said current fares in Wisbech were the cheapest internationally but Councillor Phil Hatton argued that in a low wage area increased fares would hit the public hard. Taxi- drivers who overcharge at events such as the Grand National festival are being warned that they face losing their licences. Liverpool City Council is to step up its enforcement activities following complaints in previous years that some drivers refuse to be hired until the passenger agrees to pay a higher fare than that permitted by the council. The complaints have come from both members of the public and representatives of the taxi trade and the council is stressing that the vast majority of taxi drivers only charge the permitted fares. However, it is determined to crackdown on unscrupulous drivers who take advantage of events such as the Grand National Festival when members of the public and visitors to the city rely on taxis throughout the four day event. Drivers who are found to have overcharged will be reported to the Licensing committee who could revoke or suspend their licence. All Liverpool licensed taxicabs have a set rate of fare displayed in the vehicle and the charges displayed are the only permitted charges. There are no separate fares payable due to the Festival and the public are encouraged to only pay the fare displayed on official tariff sheets in the taxi. This year the Council Licensing Unit will be supplement its enforcement teams with additional officers from its Street Nuisance Team. These officers have been given delegated authority to carry out taxi licensing enforcement operations and will target taxicab drivers operating illegally. Members of the public are also asked to help and the council would welcome any information from people who have been overcharged in this manner and can provide details of the driver or vehicle involved. Information may be provided by phone on 0151 233 3015 or in writing to The Licensing Unit Municipal Buildings Dale Street Liverpool L2 2DH. Hackney carriages in Manchester are set to increase fares. The increase journey prices is 4.3 per cent following an annual review. It means a ride in one of the city’s Hackney carriages will cost £7.60 for a three-mile journey during the day and £10 at night under plans due to be approved by councillors this week. The changes will also allow drivers to start their meters, with a £2.30 charge, after 370 metres – compared to the current 387 metres – or 224 metres at night, between the hours of 10pm and 6am. Fares will rise by 20p every 174 metres thereafter, instead of 182 metres currently, during daytime hours and every 130m at night. There will also be a rise, from £20 to £30, in the amount drunk passengers have to pay for a cleaning charge if they are sick in the cab. The changes, which are said to have been agreed by drivers were approved by licensing chiefs yesterday and are due to come into force on June 1. Coun Nigel Murphy, Manchester’s executive member for the environment, said: “The city council reviews Manchester’s hackney carriage fares annually, using a formula based on factors such as rising fuel and insurance costs. “This year, after applying the formula, a 5.8 per cent fare increase was indicated, but the committee was concerned about Manchester taxi passengers getting hit in the pocket, as well as black cab drivers potentially getting priced out of the market. “Following consultation with the trade, a recommendation was made to the committee of an alternative increase of 4.33 per cent. Councillors have refused additional increases to cover the cost of barrier charges for black cabs picking up or dropping off at Manchester Airport and Piccadilly Station.